Turkish officials and international Muslim associations have continued their strong condemnations of last week's terrorist attack in New Zealand that left 50 people dead. The Organization of Islamic Cooperation's (OIC) Women Consultative Council, chaired by Esra Albayrak, extended a letter of solidarity with New Zealand's Muslim community to Prime Minister Jacinda Ardern. 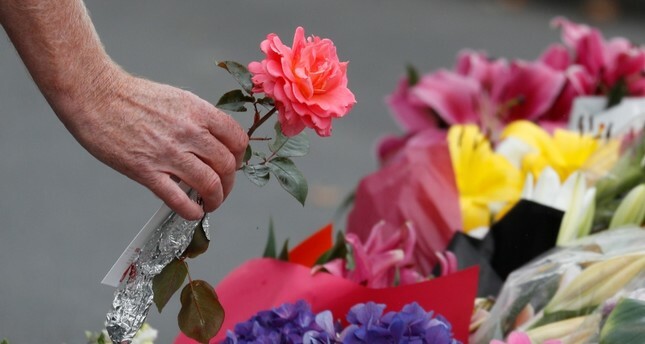 The council, which convened on Sunday, strongly condemned the "atrocious and appalling" terrorist attack on worshipers at the Al Noor and Linwood Avenue mosques in Christchurch.At least 50 people were killed when 28-year-old terrorist Brenton Harrison Tarrant opened fire on worshipers attending Friday prayers, first at the Al Noor mosque and then at the Linwood Avenue mosque. "Our hearts, support and solidarity go out to the families of the 49 whose lives were taken before their time, and to those who continue to fight the life-threatening injuries brought about by senseless brutality," the letter read, wishing God's mercy on the deceased, a speedy and full recovery to the injured and healing for the community as a whole. The death toll in the terrorist attack rose to 50 on Sunday. The council called the attacks an "assault on our shared humanity," emphasizing that the massacre was not an isolated event by an individual, but arose out of an "environment of hatred, bigotry and Islamophobia that has been ignored and fed for years." The letter, which was signed by nine members of the council, commended Prime Minister Ardern for her strong leadership and work to bring unity amid difficult circumstances. Turkey currently holds the rotating OIC presidency, which includes term presidency of the Women Consultative Council, chaired by Albayrak. The OIC has called an emergency meeting for Friday in Istanbul to discuss causes, impacts and steps forward in the aftermath of the New Zealand terror attacks. Iran and Pakistan's foreign ministers held phone calls with Foreign Minister Mevlüt Çavuşoğlu over the weekend in which they agreed to summon a meeting. In a statement, the Iranian Foreign Ministry said Javad Zarif called for "appropriate reaction of Muslim states to this heinous crime." Çavuşoğlu and Vice President Fuat Oktay are currently on a two-day visit to New Zealand to underline Turkey's firm stance against anti-Muslim ideology and xenophobia, as well as to show its solidarity with New Zealand upon the terror attacks. While the strongest condemnations have been voiced by Muslim leaders and civil society from the world, Western media and leaders are keeping their silence, giving weak reactions. The BBC refrained from using terrorism for the attack that left 50 dead, U.K.'s Daily Mirror newspaper defined Tarrant as "Angelic boy." Some social media users criticized BBC's rhetoric, comparing the attack in New Zealand with the one occurred in London in March 2017, which killed six people and referred to as "terrorism" by BBC. "A knife attack in London means a terrorist attack for BBC managers but the massacre in New Zealand is only an attack," Iranian Ambassador in London Hamid Baeidinejad wrote on Twitter last week. Regarding BBC's rhetoric, Pakistani Minister for Human Rights Shireen Mazari wrote "Watching @BBCWorld now and shocking how BBC reporter from Australia not prepared to use word 'terrorism' when discussing the NZ mosque terror attacks! Instead of saying 'mass killings'! Sick. Why the reluctance to use the word 'terrorism' for what is clearly a terrorist attack?" Former BBC Editor Rifat Jawaid also described BBC's policy as "shame," writing "Hey @BBCWorld and @BBCNews, as a former BBC Editor, I feel incredibly disappointed with your glaringly biased editorials. Both Aus and NZ PMs have called #ChristChurch carnage as a terrorist attack. But for your TV and online editors, this is only a mosque attack! Shameful!" Daily Mirror, on the other hand, while defining the terrorist attack as "Massacre at the Mosques," defined perpetrator of the attack, Tarrant as a person who "was a likeable and dedicated personal trainer running free athletic programs for kids." Erdoğan accused Monday the western leaders of having double standards in categorizing terrorism. "All of the world leaders describe the terrorist attack in New Zealand as an attack on Islam and Muslims. They do not call the perpetrator a 'Christian terrorist.' Why can't they say that?" Erdoğan asked at an election rally in İzmir.